True Water Australia has been contracted to design and install a replacement sewerage system for Mingo Crossing Caravan Park, situated 125kms west of Bundaberg on the banks of the Burnett River in central Queensland. Mingo Crossing Caravan Park and Reserve was devastated by the Australia Day floods in January 2013. Owned and operated by North Burnett Council, consulting engineers Cardno and GHD, were appointed using the flood relief fund resulting from damage caused by ex-tropical cyclone Oswald. Following an extensive review, True Water Australia met the rigorous requirements to withstand frequent flooding and to deliver high quality of treated water set by the builders Cardno, GHD and Council. As with all accommodation providers, the seasonal nature of accommodation results in highly variable flow rates. 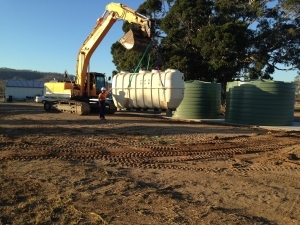 True Water Australia installed a Kubota commercial HC treatment plant capable of processing 12,000 litres of wastewater daily with a sub surface drip irrigation system pumped outside the 100m buffer zone of the Burnett River. In addition, a 50,000 litre wet weather storage tank was installed to retain treated water during periods of extended rainfall. Water quality and flood proofing the system were particularly important due to the proximity to the Burnett River, and an odour and noise free solution was also required. True Water Australia’s solutions deliver the highest water quality treatment exceeding all regulatory requirements, ensuring best practice outcomes for the client. Our cost effective solutions use world leading technologies that are designed to last, have low running costs and low maintenance requirements, saving money now and in the future. Work is currently underway and is due for completion shortly.